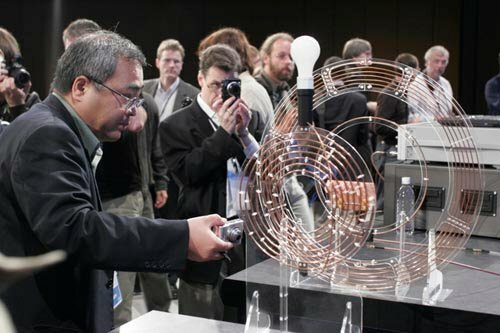 Intel has demonstrated its new wireless power technology at this years IDF. The technology demonstrated comprised of two metal arrays that connect to a power amplifier, the arrays resonate and establish a link of energy between each other. The power is then transmitted from one metal array to the other. The technology isn’t exactly new but Intel have achieved the highest efficiency with the technology to date with 75% efficiency when transferring 60 watts of power over a distance of two feet. The technology isn’t ready to charge your favourite gadgets just yet, but as with anything Intel does I am sure it wont be more than a few years before we see a usable version of this technology in everyday electronic devices. Imagine a world with no wires needed to power your gadgets, it certainly would make life a lot simpler for gadget fans like myself.